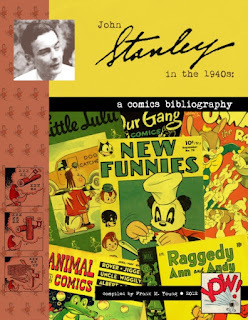 STANLEY STORIES: Drawn + Quarterly Plugs The John Stanley 1940s Bibliography! Drawn + Quarterly Plugs The John Stanley 1940s Bibliography! It's been said time and time again--Frank Young is providing one of the great internet services with his Stanley Stories blog. Trenchant commentary on all phases of the great John Stanley's cartooning and writing careers would be enough but Frank also does some serious detective work and constantly discovers new Stanley material in the nooks and crannies of the Dell catalog. Easily my favorite historical comics website. Okay, so I titled this post "Late to the Party" because I'm at least three months late with this post to celebrate Frank's amazing achievement--A comprehensive bibliography of John Stanley's 1940s comics work. For me, this is one of the great comics nerd resources out there. Check it out. Go buy it... Do it!! See the original post HERE--and, as ever, thanks, Tom! A well-deserved plug! I love this index! Have you looked into getting onto Amazon, and/or as a Kindle ebook? Might be some sales potential there.